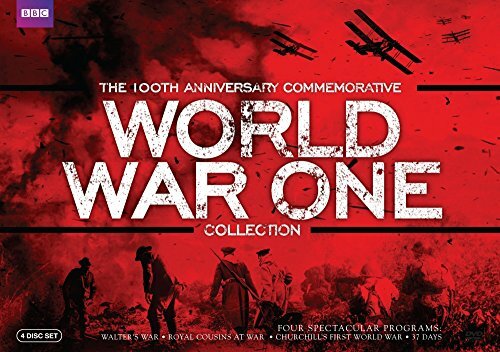 New York - BBC Home Entertainment continues to commemorate the 100th Anniversary of the start of World War One with the World War One Collection , available on November 4, 2014.This collection features four gripping BBC productions ranging from documentary to docu-drama that unlock the mysteries of this important chapter in our history and share a fresh perspective on how it came to be. 37 Days covers from the assassination of the archduke Franz Ferdinand to the tragic declaration of war between Britain and Germany. Royal Cousins At War reveals the uneasy relationships among King George V, Kaiser Wilhelm II and Tsar Nicholas II, and the roles the three cousins played in the frantic days before war broke out. Watch 39-year old Winston Churchill try to recover from personal and professional disaster in Churchill's First World War. And in Walter's War, be inspired by the story of Walter Tull, the professional English football star who became a heroic warrior and the first black officer in the British Army. The set also includes a collectible replica of the front page of the Daily Mirror from the day war was declared in Europe. A three-part political thriller, following the catastrophic chain of events within 37 days which started with the assassination of the Archduke Franz Ferdinand on June 28, 1914 to the declaration of war between Britain and Germany on August 4th, 37 Days: The Road to World War Iexplores with breathless tension the tragedy of how Europe's old conventions of secret diplomacy fell apart - or were destroyed. With stunning performances and a fresh angle on an iconic story, this provocative factual drama unlocks the mystery of the war's origins, overturning common assumptions about its inevitability, demonstrating that World War One did not happen by chance, nor was it a foregone conclusion - it took considerable effort and staggering bad luck, to disastrous and tragic effect. Starring Ian McDiarmid (Star Wars) and Tim Pigott-Smith (Quantum of Solace). At the outbreak of World War One, three cousins reigned over Europe's greatest powers - Tsar Nicholas II of Russia, Kaiser Wilhelm II of Germany and King George V of England. This two-part series narrated by Tamsin Greig (Shaun of the Dead, Episodes) looks at the role played by the three monarchs, and their relationships with each other, in the outbreak of war. Mismanaging their countries and mishandling foreign policy, they failed to adapt to the forces of nationalism and democracy, and so brought tumbling down their own ideal of a Europe governed by the descendants of Queen Victoria. While it was war that delivered the final blow, this fascinating series shows how the problems had set in much earlier. This landmark docu-drama re-examines the darkest hours of one of the 20th century's most remarkable heroes, offering a fascinating re-evaluation of the epic and traumatic experiences of Winston Churchill in World War One and his contributions as Britain's greatest warlord. Disgraced by disasters in the Gallipoli wars and with his political reputation in tatters, Churchill was all but finished. He was also tormented, for he knew that he was one of the very few political leaders opposed to the dreadful one note strategy of endless attrition in Flanders, which was "chewing up a whole generation on barbed wire." His invention of the tank and promotion of air power stemmed from his determination to find another strategy. Using Churchill's own words as found in the extraordinary correspondence he sent from the trenches to his wife Clementine to reveal intimate insights into his personal life, as well as life on the front, and with testimony from leading historians and military experts, this is the story of his fall - and his road to redemption. Starring Adam James (Band of Brothers) and Verity Marshall (A Doll's Life). Walter's War tells the story of Walter Tull, the first black commissioned officer to serve in the British armed forces during World War One. Having gained a reputation for himself in the Army through his leadership skills, Tull (O.T. Fagbenle, Breaking and Entering) discovers that he is being put forward for officer training. The other recruits come from far more privileged backgrounds, but he manages to make history despite the prejudice he endures. Follow this brave warrior from his daunting personal battles to the front line in this gripping historical tale. Bonus materials include The Somme: From Defeat To Victory, a powerful dramatized documentary that tells the story of the most infamous battle of World War One - the Battle of the Somme. BBC Worldwide North America is part of BBC Worldwide, the main commercial arm and a wholly-owned subsidiary of the British Broadcasting Corporation (BBC). In the U.S. and Canada the company operates cable channels, BBC Worldwide Productions, BBC Consumer Products, BBC.com and BBC Worldwide Sales & Co-productions. Under these businesses fall two key brands in the U.S. - digital cable channel BBC AMERICA with programs Doctor Who, Top Gear and Orphan Black, as well as smash hit Dancing with the Stars made by BBC Worldwide Productions.